Shoulder joint (glenohumoral) pain is very common in adults over 40 years old. If you feel tight or pain inside the joint or even worse, not able to lift up your arm, and wake up in the middle of night with aching shoulder, you will be worried and visit your doctor to see what is going wrong. Wait for a while, I believe you already have been suffering stiff neck and shoulder for a long times before the current ailment. The glenohumoral joint pain in most case is just the late stage of one problem – scapulae instability. I categorizes the problem into four stages. 1st. stiff neck stage. This stage usually starts in late teenage. The most common symptoms include tight shoulder and neck. Sometimes the condition temporarily gets worse -severe muscle pain around the neck and hard to move. Most people will ignore it or think massage will be helpful. 2nd. upper back pain stage. This stage follows the 1st stage so mostly it appears in 20 to 40 years old. Its clinical manifestations include symptoms in stage I plus pains between scapulae. Sometimes affects breathing mimics heart attack. 3rd. glenohumoral joint pain. This is the stage patients start to worry and seek for medical help because of the deep pain inside the joint and could not be relieved by strong painkillers. It most happens after 40 years old to any age later in life. 4rd. 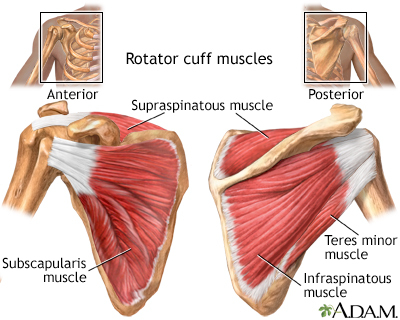 rotator cuff partial or total tear. Persistent pain in the glenohumoral joint will end with rotator cuff tear, especially the supraspinatus tendon. The pain is so bad that the patients hardly are able to lift up the arm. Although the clinical manifestations are very different between the four stages, they are only one unique problem – scalupa instability. A late stage always have symptoms of all the early stage. The cause is protracted scalupae or round shoulder. It is not hard to get rid of problem at the first 3 stages if treated probably. When the rotator cuff is entirely tear, surgery is not avoidable and long time rehab is necessary. It’s always a pleasure to hear from someone with exestriep.